Pantelion Films releases The Vatican Tapes nationwide on July 24th, 2015. Mark Neveldine: The dark side is part of our dreams and part of our secret sanity world that we all have in our head. It's always nice to have a balance of light and dark. People want to see both sides. People want to see feel-good films, but they also want to face their fears. That's why people go to see horror films and thrillers. They want to push themselves to the limit because there's an adrenaline rush in that, too. NYC MOVIE GURU: How challenging was it to differentiate from other demonic possession films? MN: I didn't make a conscious decision to be different than other possession or horror films out there. The script was pretty unique when I read it. What The Vatican Tapes really is is an origin story for as an origin film. That's what was really interesting to me. Also, as a kid, I grew up Catholic and went to Catholic school, so I thought, "I've always loved The Exorcist and The Last Exorcism." I wanted to do it. It was a great challenge. I wanted to slow down a little bit and do something with a little bit more gravity. NYC MOVIE GURU: How important and challenging was it to ground the film in humanism while keeping it lean? MN: I wanted The Vatican Tapes to be more naturalistic than supernatural. I wanted to keep it human. I'm always going to be who I am, and didn't want to depart too much the quick pace of my films, but what I do know is that I don't want to beat my audience over the head. I'm not going to go out and scare you with gore. I want audience to have the information about what Angela is going through without being redundant about it. I love that, with narration, there's a shorthand. It's kind of exciting thing to do. There's a time and a place for everything, but I wanted to pull everyone in, seduce them and then, sort of, punch them in the face. Hopefully, they'll enjoy that. NYC MOVIE GURU: What's the reasoning behind choosing the opening sequence in The Vatican Tapes? MN: The idea was to have something frenetic and a little more in-your-face initially. I wanted to do something fun to introduce a movie that might have a slower pace than what my audience is used to. NYC MOVIE GURU: Do you believe in the supernatural? MN: I don't believe in the supernatural; I believe in the truth. I believe that there's a God, and that people are afraid to look further than themselves. With all the bad things going on in the world, you would assume that people might want to investigate a little more what's happening and what the undercurrent is. That's what I was trying to attack in the film. I'm trying to scare you with the natural world---the devil can choose you, and that's fascinating to me. NYC MOVIE GURU: How has your prior experiences in many different aspects of filmmaker helped you as a director? MN: One of the things about having the experience of many different sides of filmmaking is that we didn't have a lot of time to make the film. It was the shortest schedule of any of the films that I've worked on. Having the knowledge of all those things, and bringing in the department head and others that I trust, that's what helped. We had a little bit of rehearsal time with the actors, so that really helped [as well]. We wanted to be lean about the visual effects, and wanted them to be as natural as possible and intrinsic to the story. So, I'm always a fan of doing as much as I can in the camera, but of course to give them audience a little bit more, you have to dive into visual effects. NYC MOVIE GURU: Would The Vatican Tapes work in 3D? How do you feel about 3D in general? MN: 3D is fantastic for the right film. Certainly, for The Vatican Tapes, we there are moments that could use the depth of 3D. Maybe that would help with a jump scare, but I don't think it's really needed for it. It's not that kind of film. Ghost Rider: Spirit of Vengeance worked in 3D, and Gamer and Crank would have been great in 3D, but that's not the case for The Vatican Tapes. I do love 3D, but I wouldn't want 3D every time I go to the movie theater, but 1 out of 10 times is very exciting. MN: Sometimes I wish I was more of a scholar to answer that question. If you hit certain truths of what people are scared about, the things that keep people up at night and give them anxiety panic attacks throughout the day---if you sort of tap in to those real human emotions, then you have something that's lasting. I hope that there are moments in The Vatican Tapes that truly scare people. NYC MOVIE GURU: How do you feel about found footage? 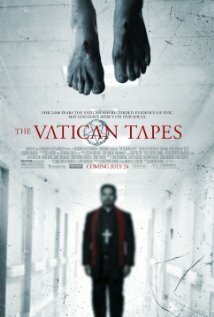 Was there any consideration to make The Vatican Tapes as found footage? MN: Found footage works really well for the right project. Just so you know, the original script for The Vatican Tapes was a found footage movie. Lakeshore came to me and said that we need to make it more dramatic and that they're not interested in the found footage version of this movie, so it was a really fun to change the point of view of this movie. I'm glad that we did. It gave a gravity to this story. I think there will always be a great opportunity to tell a story through found footage, but that's not we did with the film. NYC MOVIE GURU: How challenging and important was it to get a PG-13 rating? MN: When I financed the film, Lakeshore and Lionsgate said to me, "Look, we're very excited that you're making this film, but we want a PG-13 version. We know it's going to be challenging for you, but we want it PG-13. That said, we want it to be as honest as we can with the scares, and see how far we can push it." I think we did a good job of being balanced---I think we're a PG-15 movie. The MPAA let us get away with a couple of things that the audience will appreciate or maybe not. It gives us a broader audience. I'd be so excited to dive into part 2 of this movie and develop more of the origin story. NYC MOVIE GURU: Roger Ebert once stated, "Horror films don't need a big star because the big star is the horror." Do you agree or disagree? MN: Absolutely. I think that that's the case for any movie. I think that for any movie, if the actors are great, you don't need big stars. Sometimes there are movie stars that can alienate a thriller by taking audiences out of it, so he's right. Maybe he's moreso right in terms of marketing a horror film because you don't have to market a face, you have to market fear. So, he's very smart in saying that. NYC MOVIE GURU: Do you think that something would be lost if The Vatican Tapes were seen on the small screen instead of in theaters? MN: I do. I think there are a couple moments that you really want to be in the theater to see--in the 3rd act especially. These performances are bigger than life, and it's scary. The visual effects that we did look so incredible on a 40-foot screen. This is a movie that you want to see with an audience and take the journey with them. NYC MOVIE GURU: What would make a great double feature with The Vatican Tapes? MN: Groundhog Day and Caddyshack would be my choices.